After Love missed with a left land, the unheralded Medina countered with a vicious combination of punches to the chin and head that dropped Love face-first to the canvas. 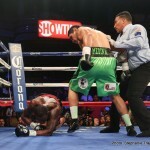 Love attempted to get up but referee Tony Weeks stepped in and stopped the fight at 39 seconds into the third round. 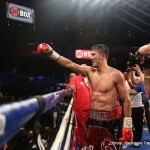 It was the 123rd time since the series began 13 years ago that an unbeaten fighter suffered his first loss on ShoBox. 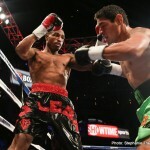 Both of Love’s Mayweather Promotions’ “Money Team” teammates were triumphant in their ShoBox fights. 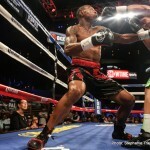 Once-beaten Badou Jack (17-1-1, 11 KOs), of Stockholm, Sweden, bounced back from a first-round KO defeat to pitch a near 10-round shutout against Jason Escalera (15-3-1, 12 KOs) of Union City, N.J., and talented Romanian 168-pounder Ronald “Thrill” Gavril (10-0, 8 KOs) scored one knockdown en route to an impressive seventh-round TKO over hard-trying Thomas Falowo (12-3, 8 KOs) of Pawtucket, R.I.
“I knew in the beginning that he was going to box so I was focused on cutting off the ring and applying pressure at all time,’’ a jubilant Medina said afterward. “I was very surprised the fight ended like it did when it did. I expected to win but not in this kind of explosive fashion this early in the fight. 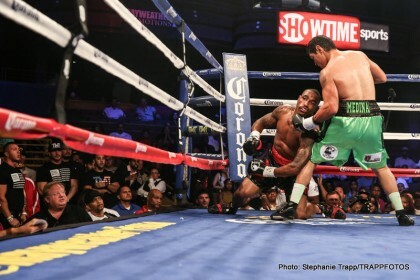 Offered ShoBox expert analyst Steve Farhood afterward: “This was a classic case of the fact that no tuneup is ever a fully safe tuneup. Love was on the verge of securing a shot at the world title and, on paper, Medina was the kind of opponent who figured to suit him well style-wise. Leon was taken by ambulance to a nearby hospital for observation. He left on his own recognizance. Boxing superstar and 11-Time World Champion Floyd Mayweather, who faces Marcos “El Chino” Maidana in the main event of “MAYHEM: Mayweather vs. Maidana 2” on Saturday, Sept. 13 live on SHOWTIME PPV® from the MGM Grand Garden Arena in Las Vegas, watched the nine-bout Mayweather Promotions fight card from ringside. He was interviewed by Farhood after the Gavril-Falowa fight. 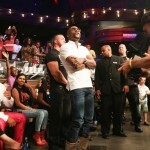 “I was impressed with [Ronald] Gavril”, Mayweather said. “He should’ve gone to the body a bit more, but he’s still in the learning stages of his career. I believe that he is a future world champion. Eddie [Mustafa] Muhammad is his trainer, who is one of the best trainers out there. Gavril is still working very hard in the gym so in the future there should be some very good results. “I think I have gotten much stronger in this training camp [for Maidana rematch]. I’m making sure that my body is stretched the right way. Every camp is different, but I feel comfortable and I’m pretty sure my opponent is ready to fight because I am. All I try to do is to stay positive and get good work in. “I am able to make adjustments and adapt very, very easily. I’ve made adjustments before, even with my last rematch almost 12 years ago against [Jose Luis] Castillo. I’m in tip top shape and am a lot stronger this fight than when I first fought Maidana. My conditioning is also exactly where it needs to be. “If you look back at the fight, I think it was very exciting for the first three or four rounds and out of 12 rounds I would say he won three rounds, but I dominated for nine rounds. The fans, critics and people are so used to me winning 11, 12 rounds or knocking a guy out. To have an opponent actually put up a good fight for four rounds [is something that is unusual in a fight of mine]. All throughout the fight I was boxing and being sharp and Maidana was constantly being dirty. “All I can do is go out there and win and be the best that I can be. I can’t look for any help from the referee. I strictly believe that there will be an even playing field. I want the referee to do his jobs on both ends. “I feel good, every time I go to training camp I feel good. I think this time I am going to display something totally different from the first fight. I don’t think that age plays a factor. All I have to do is keep my composure, be smart and be the same Floyd Mayweather. 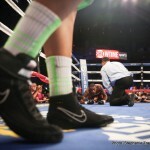 Saturday’s Special ShoBox aired on SHOWTIME immediately following the premiere of “ALL ACCESS: Mayweather vs. Maidana 2” Episode 1 and was screened for Floyd and the fans in attendance inside The Pearl to watch before the televised fights began. Jack won by the scores 100-90 twice and 99-91. “I didn’t have any nerves going into this fight based off of what happened in my last fight,” he said. “I had a long training camp and we worked on all my mistakes from my last fight. I told everyone that it was just a lucky punch after my lazy jab and I was just caught, stuff happens it’s boxing. “My defense was the best it has ever been in a fight and that’s a credit to my assistant trainer [former WBA Light Heavyweight Lou De Valle]. 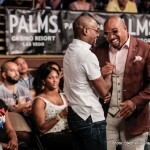 He’s like my brother and after the last fight I called him and told him that I needed his help and I know that Leonard [Ellerbe] and Floyd [Mayweather] really like him. Gavril was pleased after a fine performance in which he turned back a determined bid from Falowo to remain perfect. 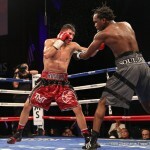 The fight was stopped by the referee as Gavril was landing one flurry after another of unanswered punches. “I was very happy with my performance,’’ Gavril said. “I worked very hard for this, and I’m glad it showed. I am especially pleased because I knew I had some Romanian fans in the house. He was very tough and came to win. After I knocked him down in the third, he came back and won the fourth. Saturday’s three-fight telecast will be available at SHOWTIME ON DEMAND® beginning Monday, Sept. 1 at 10 p.m. ET/PT. Barry Tompkins called the ShoBox action from ringside with boxing historian Steve Farhood and former World Champion Raul Marquez serving as expert analysts. The executive producer is Gordon Hall with Richard Gaughan producing and Rick Phillips directing. 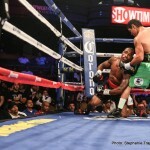 Previous boxing news: Manny Pacquiao: NO Floyd Mayweather Talks; I’m Looking For Danny Garcia!